Two celebrations will be held in November 2017: one in Inuvik, and one in Tuktoyaktuk. This is sure to be a momentous time for the Beaufort Delta, after decades of efforts to bring a highway to the Arctic Ocean. But before we can get there, we have some work to do. Our crews are busy installing culverts and bridges, building up highway embankments and more. We expect the majority of this work to wrap up by the end of April, 2017 after which we will begin placing surfacing gravel and installing signage in the months of July, August, September and October 2017. Another highway to the Arctic Ocean? Sweet. The existing ice road closes Thursday for the last time ever. TUKTOYAKTUK (April 10, 2017)—The Hamlet of Tuktoyaktuk and the Government of the Northwest Territories will be celebrating the closing of the last ice road to Tuktoyaktuk on April 13, 2017. The ice road has long served as an important link for residents of Tuktoyaktuk, supporting intercommunity travel and the delivery of essential goods. Public celebrations are planned in Tuktoyaktuk to honour the many individuals who worked tirelessly over the decades to keep the ice road open. The event will be held from 5:00 PM to 10:00 PM at Kitti Hall and will feature Inuvialuit drum dancing, a community feast, snow sculptures, outdoor snow village, polar dipping (dip your toe in the Arctic Ocean), and more. The ITH will be Canada’s first road to the Arctic coast, connecting the country from coast-to-coast-to-coast and fulfilling a Canadian vision held for more than fifty years. The highway will support unique tourism opportunities for visitors to the Beaufort Delta. Any idea if the road will be assigned a route number (or be an extension of highway 8)? ￼The Inuvik Tuktoyaktuk Highway (ITH) is now less than three months away from its scheduled opening on November 15, 2017. The summer construction season involves the application of surface gravel, ongoing embankment shaping and compacting, weekly inspections, as well as weekly water sampling of major drainage crossings, bridge crossings and pits. Research projects along the ITH—like the Sentinel Permafrost Monitoring Program and the Alternative Drainage Structures Sites—have provided valuable data that will help improve highway construction techniques and minimize environmental impacts. Celebrations for the closing of the last ice road from Inuvik to Tuktoyaktuk were held on April 21 and included speeches honouring current and former contractors. Planning is underway for celebrations in Inuvik and Tuktoyaktuk to mark the highway's official opening. Attendees can anticipate an assortment of activities, including a feast, Inuvialuit drum dance, fireworks and a ribbon-cutting ceremony. Federal and territorial dignitaries will also be present to commemorate the historic day. New from the CBC, here's an extended 12-minute video report on the new highway. Spoiler: The CBC vehicle gets a flat tire. The new highway opened on schedule. But there's a twist on the original naming/numbering plans. NT's newly-amended official route designations indicate the highway will not be treated as an extension of NT 8 or the Dempster Highway. The highway will instead be NT 10, and named the "Inuvik-Tuktoyaktuk Highway". See page 4 of the regulations (definition of NT 8/Dempster Highway unchanged) and page 8 (definition of the new highway). No clue about why the new highway was numbered 10, skipping over 9 (not assigned to any other highway in the newest regulations). Maybe NWT-9 is reserved for another future road like linking it to the Nunavut territory to localities like Kugluktuk (formely known as Coopermine). Windows skipped 9. iPhone skipped 9. Maybe this is the same. thence northeasterly for 2.6 km to the south bank of the Mackenzie River; thence northerly across the frozen surface of the Mackenzie River for 3.1 km to the north bank of the Mackenzie River; thence northerly and westerly for 6.8 km to its intersection at kilometre 25.9 with Yellowknife Highway No. 3; being a distance of 12.5 km approximately. I drove the detour route to both banks of the Mackenzie in 2015, well after the Deh Cho Bridge opened (if there was route signage, it isn't there anymore). It still serves homes and recreational sites, but AFAIK there is no longer an ice crossing maintained there, since eliminating the crossing freed up funds to help build the bridge. The former ice crossing was a few miles upstream (east) of the former ferry crossing and the new bridge, so the ice crossing could be readied for traffic in early winter while the ferry was still open, and then the ferry could float downstream to its winter drydock in Fort Simpson. Until the regulations were amended this month, there was an entry for the ice road between Inuvik and Tuktoyaktuk, which was closed for good last winter in anticipation of the new all-weather highway replacing it. Part of that ice road lives on (but not yet open for this winter), as part of the Aklavik Ice Road to a village northwest of Inuvik on the west bank of the Mackenzie. Interesting. Possible long-range plans to extend it up the Mackenzie River? Possible long-range plans to extend it up the Mackenzie River? It already comes within spitting distance of the Arctic Ocean, nowhere else to go. The now-closed ice road it replaced was on the Mackenzie all the way to the ocean, then crossing the ocean the rest of the way to Tuktoyaktuk. You might have in mind the conversion to all-season of a winter road from the end of NT 1 near Wrigley, roughly parallel to the Mackenzie to Fort Good Hope. That conversion is well into the planning stages. Indeed, GNWT has already built permanent bridges over stream crossings, to extend the operating season of the winter road but also to become part of the planned all-season road. Ultimate plans are to extend that road past Fort Good Hope to NT 8 south of Inuvik, which would provide a direct road link from Inuvik and Tuktoyaktuk to the rest of the Northwest Territories without a long detour through the Yukon and northern British Columbia. More likely that number will be assigned to the proposed all-season road to Whati, which would replace an existing winter road west of Yellowknife. 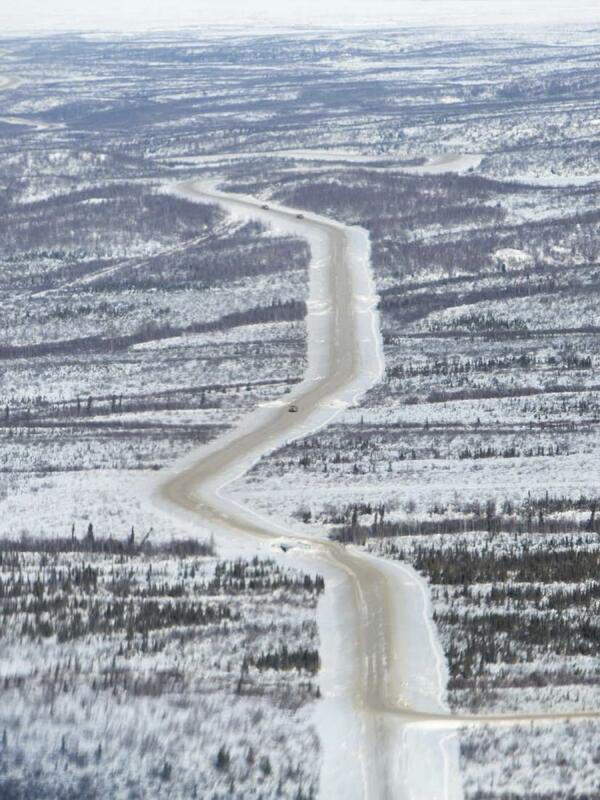 A highway from NWT to Nunavut's part of the Arctic coast has been talked about, but AFAIK is just a "wish list" item. It seems the spring thaw has been unkind to the road. For a time, the highway was open only from midnight to noon, in hopes that the cooler temperatures would help firm up the roadbed, which was having issues with mud and slush. Now, according to the GNWT road conditions website, the road remains subject to rotating closures, with soft, slippery and/or rough sections. 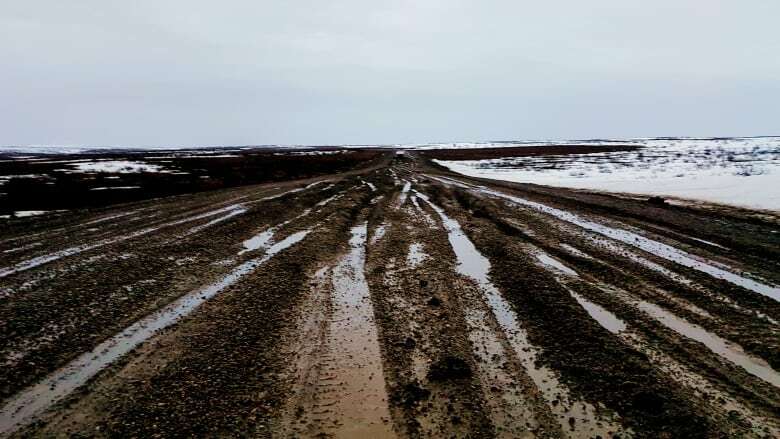 Construction crews will return in June to work on these problems, as well as take care of some work left over when the highway was opened in November (perhaps rushed a little, so the transportation ministry would not have to reopen the former ice road to Tuktoyaktuk). I had hoped to go there in June, to field-check the new highway. A local rental car agency, that was willing to rent an SUV for the trip to Tuktoyaktuk if the road were in better shape, suggested I shoot for later in the summer. Shitsticks, I was planning to drive up there in early June - had everything planned and everything! I'm going to hold out hope it'll be fine, since I'm already going to be up there regardless. As I look I'm not seeing any sign that this is for sure closed until June - just that there may continue to be rolling closures - predictable rolling closures are fine in my mind. Have we actually seen any news releases since the CBC articles in late April? After researching this, I think my plan is to now stay in Inuvik instead of Tuktoyaktuk, so I can get up at 4 or 5 AM and drive to Tuk and back in the midnight to noon window, which is kind of lame but still doable. At least you'll be there in your own vehicle, so the car rental agencies will have no say. My only vehicle now is a Prius, which can't do the Dempster, so my plan was to fly up to Inuvik from Edmonton and rent. The company I contacted is one I've rented from before in another location, and is not fussy about going off-pavement, but is nervous about the road to Tuk in its present condition and less than confident about how much better it'll be in June. I'm the Travel Mapping maintainer for the Northwest Territories, and in December added to TM the road to Tuk as NT route 10. Assuming you travel the highway this summer and I end up not going, any comments would be welcome, especially route signage and where it begins (at the Marine Bypass Road junction, or farther north as I have it?) and ends. Also, pay attention to the two ferry crossings on the Dempster Highway south of Inuvik. Right now, one is closed for the season; the other is not, but subject to short-notice closures. On average, both are open by June 2, but if your luck is bad you won't even be able to get to Inuvik. Definitely - I'll make sure to thoroughly document. I'm hoping it'll work out - I'm overnighting in Dawson City the night before heading up, so I can make the call at the very last minute. If it doesn't I may swing down to Haida Gwaii on my way back instead and do that, but that's much more expensive. I asked about upriver, not downriver - fully aware that it meets the Arctic Ocean. The rest of my reply covered the possible extension of the Mackenzie Highway (NT 1) from Wrigley to Fort Good Hope (basically conversion of the existing winter road to all-season), and ultimately on a new roadway to connect to the Dempster Highway south of Inuvik, both roughly following the Mackenzie River. Planning has advanced on part of that corridor. Construction has already started on 14 km of all-season road south of Norman Wells (see this article, before construction began, with a map and more info on that project). But the overall project is still a long ways off, with no timetable for completion. The road has been closed because a section of road was not laid with gravel and compacted before it became too cold to finish the work last fall. ... Officials with the Infrastructure Department and work crews are working on the highway to make it safe to travel again, Schumann said, and it could reopen as early as May 29 if the weather permits it. FWIW, the Weather Channel's 15-day forecast for Inuvik is snow showers today and tomorrow, then quickly rising well above freezing, but at least no more precipitation likely. Dryer would be better for reopening prospects, but warmer weather might make soft spots worse until crews can make more extensive repairs than can be done by the time corco gets there in a week or two (if he can, which would require the reopening of two still-closed ferry crossings on the Dempster Highway south of Inuvik). The CBC article confirms my hunch that the opening of the all-season highway to Tuk was rushed a little, so the ice road to Tuk would not have to be reopened for yet another winter.